I am going to admit it- it has been a long time since I have been to a Truck Series race- especially a truck race at Las Vegas! So when Misty mentioned us applying for credentials to cover it I was totally for it!! One of the best things about the truck race at Vegas is that they let anyone in the NEON GARAGE which is one of my favorite parts of Las Vegas Motor Speedway because you can look right in to the garage bays and watch the crews work on the trucks! The kids their with there parents wandering around the Neon Garage seemed to really enjoy the “behind the scenes” views- and they especially enjoyed it when the drivers would wander over to the autograph windows at the rear of each garage bay between practices. Sometimes the garage passes are a bit pricy for the cup races and might prevent families from enjoying the garage area. The fact that the neon garage was free was great because the kids could experience the garage area for free which makes the event family friendly! And that is how you hook a young race fan. You let them into the garage area. Trust me. I know these things. It was also fun to watch some of the pressers- some of the younger drivers in the series are far less media saavy than more experienced truck and cup drivers (I am especially thinking of Ryan Blaney here- I don’t know if he is shy or what but he hardly looked up at all during his presser znd his hat was screwed down tight on his head- you could barely see his face). But everyone, fans, drivers, media: was there for one reason! THE RACE. The race was awesome and did NOT disappoint. Race winner was a very excited Timothy Peters! 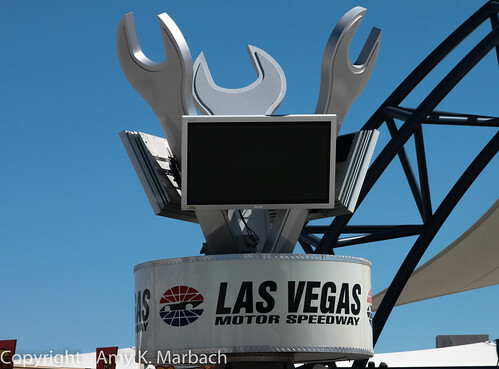 Monitors in Las Vegas Motor Speedway’s Neon Garage. (Photo Credit: Amy K. Marbach).